Powell Wellness Center (PWC) is proud to highlight our members’ wellness stories! Check out the Member Spotlight to see who is standing out from the crowd. Will you be next?! Diane is a survivor in the fullest definition of the word. She saw her mom and her sister pass from cancer, and then received her own cancer diagnosis, despite having tested negative for the indicator for the disease. She is now celebrating more than two years post-diagnosis. For Diane, PWC has served as both a retreat space and a recovery center. Diane first came to PWC through the FitScripts program, which she says gave her a great introduction to the center. When her sister was diagnosed with invasive ductal carcinoma, Diane stepped up to serve as her caregiver. She returned to PWC during this very stressful and sad period, and found solace in walking in the pool current. “My mental therapy was walking in the pool,” she remembers. Realizing that she needed to be proactive about her health, Diane underwent the BRCA test that indicates disease susceptibility in breast cancer indicator genes. She tested negative, but was considered high risk, which meant that her screening measures were intensified. In early fall 2016 after a screening, she got the call confirming cancer had been found. After recovering well from surgery, Diane was laid low by a lingering cold that severely affected her strength and endurance for daily activities. For about 6 months, she was unable to get back to her job as a merchandiser that requires lots of lifting and driving. For support, her employer had matched her up with another employee who had gone through breast cancer. “She was great to talk to and we spoke regularly. At the time she was a 5-year survivor and she offered me such support, strength and optimism,” notes Diane. In addition to the support she received from her family and work colleague, Diane participated in the cancer support group at Fauquier Hospital. She also continues to be a member of invitation-only Facebook groups for cancer patients and survivors – “my sisters,” she says. She does advise anyone looking into online groups to be careful of personal privacy and wary of scams. Another effort that Diane appreciates is Culpeper County’s Relay for Life at Eastern View High School. She is on the hospital’s team for this annual walk and says that it has been fantastic for her recovery. After reconstructive surgery, Diane decided to take action to combat weight she had gained during her post-surgery recovery period and from medication side effects. She was plagued by frequent colds and back pain and wanted to improve her health and regain muscle. In her initial efforts, Diane was supported by the Culpeper Medical Center physical therapy staff. “At first, I could barely walk around the track,” Diane notes. After she regained some strength, her doctor suggested Weight Watchers (now known as WW). She also started working with a trainer at PWC. Thanks to Diane for sharing her story and best wishes to her as she continues on her health journey. Imagine wielding a 3-pound sword while wearing a heavy helmet, thick padded clothing, and protective coverings for your arms and legs — moving about in this gear presents challenge enough. Add the intense physical demands of swordplay with an opponent ― endurance, strength, agility and flexibility are needed for success in a match. There’s no doubt about it, PWC member Paul’s recreational passion, historic European martial arts (HEMA), requires a high level of fitness. With an interest in swordplay, Paul spent about two years looking into recreation opportunities before HEMA came to his attention. 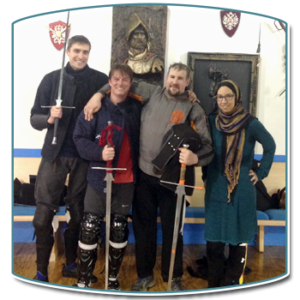 Paul liked HEMA’s emphasis on historical accuracy; to develop and fine tune their skills, many instructors and participants work with copies of ancient manuscripts that were created as instructional manuals by masters of the art of sword play from the 14th through the 16th century. When Paul sought out a trainer to work with at Powell Wellness Center, his goal was to achieve a level of fitness that would support him and help him excel at his chosen recreational activity. Over the course of a year, he worked with his trainer on body mechanics and correct form with weight lifting for strength development, as well as endurance through high intensity training. Sessions on the rowing machine for a cool-down period completed his training regimen. “My routine was not about powering through. It was about doing it correctly and developing strength with good form. I built a bigger gas tank for swordfighting, and I have never had such great confidence in myself until I worked with a trainer,” notes Paul. He drives weekly to northern Virginia for his classes at the Virginia Academy of Fencing (VAF), which offers Olympic sport fencing in addition to historical swordsmanship. After his session, Paul partners with his “battle buddy” Josh Yeager, a seasoned swordsman, for one-on-one training. Paul feels he needs two years under his belt before entering competition, although he has participated in mock tournaments that teach participants what to expect during a formal tournament. Asked what he would say to anyone interested in HEMA, Paul advises, “When you begin, don’t be scared. There is a level for everyone. Maybe you’re into Star Wars and want to look good with your light saber. At the Virginia Academy of Fencing they will match the level and intensity that you want to bring.” He described how the VAF supports many different ages and abilities, highlighting as an example a mother and son duo who regularly visit the academy for instruction. Recently Paul has taken Powell classes like BodyPump™ and TRX™ with his fiancée. He’s hoping to also do a yoga class. Sounds like he’s building on the gains he’s experienced from personal training with some serious cross training. If you are interested in HEMA, take a look at the Historic European Martial Arts Alliance (hemaalliance.com). HEMA’s online presence includes videos on YouTube that show competitions. 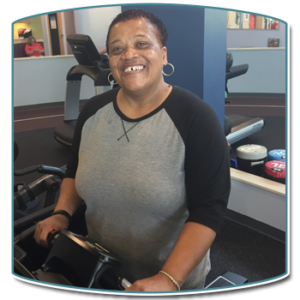 It’s a pleasure to shine the spotlight on PWC member Miss Shirley, a “regular” in the aquatic facility with a biweekly routine. Miss Shirley travels to Powell from her home in Madison County where she has lived for 60 years. She became a member of Powell in 2007, the center’s inaugural year. Over the years Miss Shirley has been a member, she has adjusted her fitness activities to serve her changing needs. Early in her membership she participated in the aquatic fitness classes, and she still remembers one of Sharon Steele’s morning classes fondly. After experiencing two knee replacements, she shifted from group aquatic fitness classes to enjoying the pool on her own. Miss Shirley’s aquatic routine offers therapeutic, cardiovascular and strengthening benefits. During her hour-long visits, she enjoys standing in the walking oval where the water for the current emerges. It’s a great spot to relax with the swirl of the warm water, which is soothing for joint or muscle discomfort. After about 5 minutes of savoring the warm current, she’ll next take a lap around the walking oval, then do another current soak. All told, her routine takes about an hour and makes great use of the pool’s therapeutic and fitness aspects. Our thanks to Miss Shirley for sharing her wellness story. Are you familiar with the Senior Games? Every state offers this opportunity for individuals 50 and older to compete in a variety of sports that can range from archery to track and field. At their state’s games, athletes may qualify for national competition. State competitions alternate on a yearly rotation with the National Senior Games competition. Virginia has a long history of participation: 2018 marks the 40th anniversary of the Virginia Senior Games. 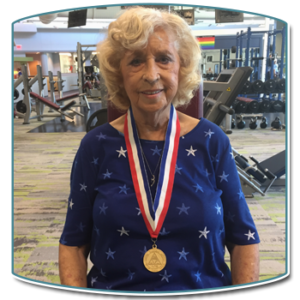 Powell Wellness Center member Maxine is a former Senior Games athlete, as is her husband Bernard. In fact, over the course of their 10 years of participation in the state games in Virginia and West Virginia, Maxine and Bernard between them won 75 medals in gold, silver and bronze! Maxine says she has always been very active, and the Senior Games seemed like a fun thing to do. She played basketball in high school, so that sport was a natural choice for her when she became involved in the Games. She won the gold medal for basketball free throws when she was 66 years old. That achievement occurred one year after she had completed five years of treatment for breast cancer. She also participated in team basketball. At one point, Maxine’s team was all set to compete in the National Senior Games. Unfortunately, one of her teammates was diagnosed with an illness and they were unable to compete. Maxine also participated in 50 and 200 meter races and played horseshoes. Bernard’s sports were golf, basketball, and volleyball. Senior Games-related travels took her to Utah, Louisiana, Pennsylvania, and also within Virginia when the Senior Games were hosted in Newport News. Although she no longer competes in the games, Maxine remains active. At PWC, she typically walks 3-4 miles on the track three times a week. If for some reason she can’t finish her mileage at PWC, she walks on her driveway. She also works out with the strength building machines at PWC. Her recollections of Senior Games activities are similarly upbeat: she is proud of her effort and grateful that she had the good health and strength to participate. And the 75 medals earned by her and her husband? Many were used as prizes at fun events that they have hosted over the years! We’re glad she was able to display one of her medals for the Member Spotlight photo! 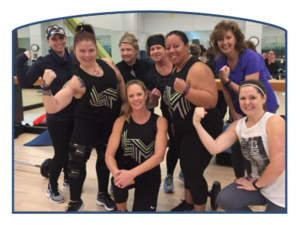 An invitation – to all members to share their fitness or wellness stories! 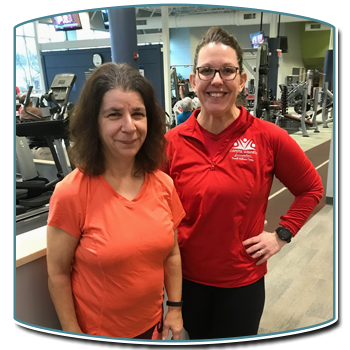 If you would like to share your story for a Member Spotlight, please get in touch with PWC Fitness Manager Patrice Barklund (540-445-5395 or pbarklund@culpeperwellness.org) or Karen Boushie, communications specialist at the Culpeper Wellness Foundation (540-445-5702 or kboushie@culpeperwellness.org). PWC member Pamela’s story is one of continuing commitment to her personal wellness journey after she confronted and dealt with some health challenges. Pamela sustained a shoulder injury at work, then found herself sitting around eating while at home. She put on weight. Pamela had shoulder surgery to address the injury. After recovering from the surgery, her next step was meeting with her primary care doctor. Pamela felt that her weight was the root cause of her health issues and she knew she had to get the weight off. She told her doctor she was tired of hurting all the time, mainly due to back and knee pain. Her doctor referred her to PWC’s FitScripts program in November 2017. She experienced success in FitScripts — over the course of 8-week program she lost 36 pounds! By continuing her commitment to personal wellness, Pamela has gotten into better shape and lost a total of 60 pounds. Last year she was able to walk 2000-3000 steps per day. 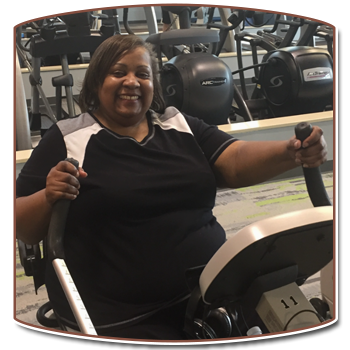 When she shared her Member Spotlight story in June 2018, she had increased to 15,000 steps per day — a new level of fitness that is the reward for her commitment. In May 2018 she participated in a 5K walk; an effort that understandably she is proud of. Pamela says she feels better and is pain free as well as happier! 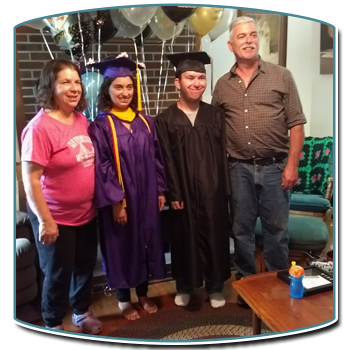 Thank you, Pamela, for sharing your story! Recently we had the pleasure of sitting down with Miss Pat as she is affectionately known by her friends and fellow parishioners. Miss Pat is 59 years old and originally from Tennessee. She is a woman of great faith who loves to sing and minister to others. In June of 2017 Miss Pat needed medical care and contacted the Free Clinic. It wasn’t an easy call for her to make. As someone who has always taken care of herself, she is much more comfortable in the role of giving to others rather than receiving help. 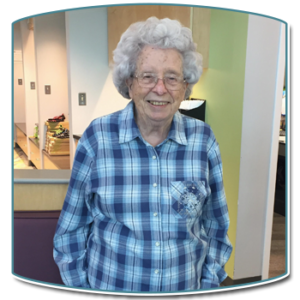 When she arrived at the Free Clinic for her first visit, Miss Pat was on all kinds of medication for chronic issues such as asthma, allergies, diabetes, high cholesterol and degenerative osteoarthritis. And, she wasn’t feeling well at all. The Free Clinic staff connected Miss Pat with medical specialists and helped her to enroll in an exercise program at Powell Wellness Center. There she received a fitness scholarship made possible by generous donors. Now, less than a year later, Miss Pat has lost 20 lbs., lowered her cholesterol, reduced her blood sugar, and is on only a few medications!